Sam started flying when he was 12 years old with an interest in aviation since he was 6 years old. His parents used to bring him to both Beverly and Logan Airports to watch planes takeoff and land. He started working at Beverly Flight Center when he was 13 years old greasing the airplane yokes and cleaning the windshields. This evolved into washing the planes in the summer to make money for flying lessons. Sam soloed at 16 years old and got his private license at 17. 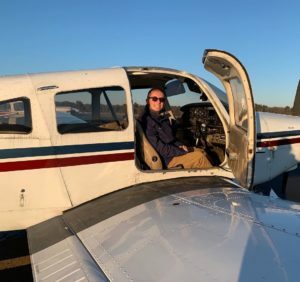 After graduating from Swampscott High School, he joined the North Shore Community College Aviation Science program where he earned his instrument rating, commercial certificate, and flight instructor certificate. He also earned his commercial multi engine certificate on the side. Today, Sam is a Certified Flight Instructor CFI/CFII at Beverly Flight Center and also manages all of Beverly Flight Center’s social media and website pages. Sam is currently studying business management at Salem State University. Sam loves flying technologically advanced aircraft, especially the Cirrus, and flying with his friends on his days off. During his time away from Beverly Airport, he enjoys aircraft photography at Logan Int’l Airport, traveling, and bike riding.